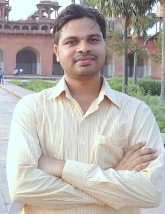 Santosh Kumar Upadhyay is an NMR structural biophysicist, interested NMR spectroscopy of protein-nucleic acid complexes. Interactions between protein and nucleic acid using solution Nuclear Magnetic Resonance (NMR). Biophysical (ITC, CD, Fluorescence etc) and biochemical methods for studying binding, structural and conformational changes and dynamics of proteins and nucleic acids. 1H, 15N and 13C backbone and side chain resonance assignments of the RRM domain from human RBM24. Upadhyay SK*, Mackereth, CD. Biomol. NMR Assign. 2016, 10(2):237-40. doi: 10.1007/s12104-016-9674-y. Grb2 carboxyl-terminal SH3 domain can bivalently associate with two ligands, in an SH3 dependent manner. Arya R, Dangi RS, Makwana PK, Kumar A, Upadhyay SK, Sundd M. Scientific Reports 2017, 7(1):1284. doi: 10.1038/s41598-017-01364-5. Structural insights into the acyl intermediates of the Plasmodium falciparum fatty acid synthesis pathway: the mechanism of expansion of the acyl carrier protein core. Upadhyay SK, Misra A, Srivastava R, Surolia N, Surolia A, Sundd M. J Biol Chem. 2009, 284(33):22390-400. doi: 10.1074/jbc.M109.014829. NMR and molecular modelling studies on the interaction of fluconazole with beta-cyclodextrin. Upadhyay SK*, Kumar G. Chem Cent J. 2009 Aug 10;3:9. doi: 10.1186/1752-153X-3-9.